Marcel Duchamp’s importance lies in his separation of artistic work from the conventional signs of artistic authorship. Cue artist Zoë Sheehan Saldaña whose exhibition Promised Land was on view at Vox Populi during the month of February 2015. I could approach writing about this work in many ways. For example, this exhibition places acute attention on the state of the gallery as a venue in persistent slight repair. 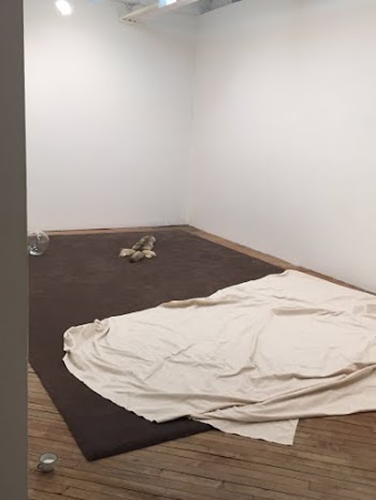 Items such as a drop cloth, paint roller, and a wall anchor occupy her installation and focus attention on the basic ins-and-outs of gallery maintenance. I could think through the title of her show, Promised Land and its seemingly symbolic references to Judeo-Christian spirituality, which appear a bit dead and longing. 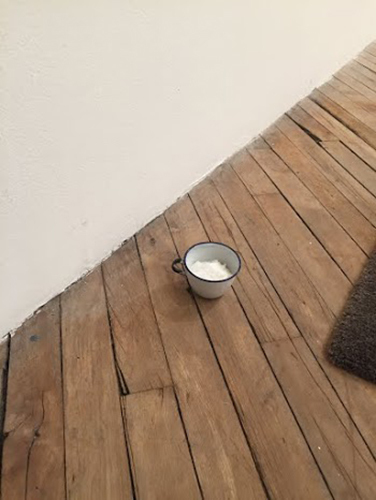 One piece titled (Offering) is a readymade cup filled with salt that diminutively sits at the space’s entrance and recalls Lot’s wife who infamously turned to salt in advance of looking back. These elements of Saldaña’s work are important to keep pinned to the back of your mind. However, they are framed by the ways she stages dense and complicated varieties of making, that are distilled in the frozen objects that occupy her exhibition. Saldaña’s space appears, at first glance, to be comprised of carefully chosen unassisted readymades. But after visually scrutinizing the pieces (while holding a readily available gallery map) one learns these objects are laced with hidden components. For example, Carpet is a large dark brown area-rug that covers most of the floor. As an object it is simple and underwhelming, and one would generally assume it was purchased. The material list, however, reveals it was ‘’created with the participation of Bill Blachly’s flock of Romney and Border Leicester sheep” and “is made of hand-tufted cut-pile wool.” This piece was handmade and, through precision and minimalism, it actively hides the collaborative and time-consuming elements that constitute Carpet. Saldaña’s piece Painting is perhaps the most startling piece on view, and it pivots the conversation of time-consuming making to the broader topic of labor. Painting is a layer of custom made white paint that covers all the walls in Saldaña’s installation. If the other works flirt with tricking the viewer into overlooking certain aspects of her objects, Painting operates by rendering the act of making invisible. Stark white walls in a gallery are of course commonplace, but Saldaña doesn’t want us to be unaware of the labor inherent in this maintenance. Every element in this exhibition sets into motion how we unconsciously ignore the way a space is maintained or an object is made. More often than not, it is through precision that we forget a person exists behind making. Painting’s price for custom application is available on request, but the paint recipe is freely distributed. Included with the gallery maps at Vox Populi are two recipes that the viewer can take to make their own Painting. The first recipe is for the casein base and the second for the white milk paint itself. Here, Saldaña suggests that anyone can be a do-it-yourselfer at home. But what is the suggestion beyond that? As I’ve mentioned, these pieces consistently hide their handmade elements. In addition the process doesn’t necessarily save money (for example, Anchor’s price is $16.52/Ea.) If one were to participate fully with Painting and complete the task of turning another space into a stark white room, she or he would conceptually and physically cover walls with layers of invisible labor. Saldaña’s work takes a physical approach to discussing the weight of invisible labor. She allows objects to embody the ways we ignore production be it handmade, 3D printed, collaborative, or otherwise. How do physical manifestations of invisibility relate to affective labor, and how are both continuously ignored? Even though these artworks enact varieties of making, they do share aesthetic traits: mute palates, minimal descriptive elements, and confident clean presentations. To revisit the piece that sits at the entrance of the exhibition, (Offering) acts out its role as an unassisted readymade in the most traditional Duchampian sense. At the same time it’s coyly at home amongst all of her time-consuming works. How does one differentiate between the readymade and the handmade when they operate the same? Which is rendered useless? She conjures these conversations, but they are ultimately weighed down by the shared aesthetic similarities. Saldaña’s gestures understand that minimalism and precision control the invisibility of her work much more than the persistence of the readymade. Generally, if the work is precise enough, we are apt to overlook it. Zachary Rawe is an artist, curator, and writer based in Philadelphia, PA. Rawe creates anxious objects and texts that animate the dissolved relationship between work and leisure.